My spirits soared as the curtain went up on the opening act of Christopher Weeldon’s Alice’s Adventures in Wonderland at its Sydney opening night. There before us a picnic was taking place in an English architectural setting, which I believe represented the Deanery at Christ Church, Oxford, home of Alice Liddell who inspired Lewis Carroll’s Alice stories. We met Alice’s family and friends, who would later take on other guises when Alice went down the rabbit hole. And the work of Nicholas Wright, who wrote the scenario and added a love interest to the story—between Alice and Jack (in later acts the Knave of Hearts)—seemed to be setting us up for an interesting evening of ballet. But after Alice disappeared down the rabbit hole the prospect of an evening of ballet disappeared with her. The most obvious feature of the work was not the dancing but the visual design and effects. True the visual features were spectacular and technically astonishing at times. I loved the tiny door that scuttled across the stage at times (see the featured image). Indeed it said more about the story than a lot of the other parts of the design—an example of ‘less is more’ perhaps? I also liked the Victorian scrapbook-style imagery that accompanied the flower waltz in Act II, except that there was too much else happening design-wise for it to be appreciated. Visual overload throughout I thought. When I go to the ballet, I prefer to see dancing rather than umpteen technical tricks and constantly changing visual ideas, as amazing as they may be. But then the choreography, when it was given some prominence, wasn’t all that interesting. I guess I have never really been a fan of Wheeldon’s work, but this time I wondered how he envisages movement in relation to the human body. With a few exceptions, notably the very slinky caterpillar, I thought Wheeldon ignored the fact that the limbs are attached to the body. Spiky leg movements seemed to predominate and when the upper body did move it seemed expression-less. Choreographically the work felt very flat, innocuous and unexceptional. All in all, however, the dancers performed nicely. With her charm and gorgeous ability to draw the audience into her world, Ako Kondo was well suited to the role of Alice. With some spectacular dancing, Ty King-Wall as Jack/the Knave of Hearts, was a joy to watch, and I enjoyed Adam Bull as Lewis Carroll/the White Rabbit, especially for the quirky, anxious character he gave to the White Rabbit. Bouquets too to Kevin Jackson as the tap dancing Mad Hatter and Steven Heathcote for a strong portrayal of Alice’s father/the King of Hearts. But I really disliked the odd changes that had been made to the character of the Queen of Hearts (Alice’s mother in Act I). All was fine when she was looking to chop heads off left, right and centre, which we know is her wont according to Lewis Carroll. But she was also written into the story as some kind of crazy ballerina who wanted to dance the Rose Adagio but couldn’t. To me the pathetically horrible take on the Rose Adagio showed a major lack of taste on the part of the creative team. Leave that kind of mucking around to the Trocks, when it is funny. 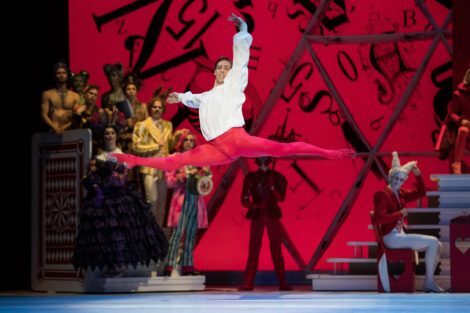 I really don’t want to see it on the Australian Ballet, and I especially don’t want to see Amy Harris, who played the Queen of Hearts, lying on her stomach, head pointing upstage, legs spread-eagled to the side, and bottom lifted off the ground and pointed directly at the audience. All we needed was the noise. Hideous! I am sure Alice’s Adventures in Wonderland is already a terrific money-spinner for the Australian Ballet, and probably many (most) people thoroughly enjoyed themselves. But watching it made me wonder where ballet is heading. Give me something that is less vaudeville/burlesque/circus-like from our national ballet company.